No matter what you're after, AAT Kings and Inspiring Journeys have New Zealand covered. AAT Kings and Inspiring Journeys share a spirit of adventure, sharing their knowledge and expertise with travellers to bring joy, happiness and positivity to people's lives. AAT Kings specialises in helping people from around the world discover and explore this amazingly beautiful country from top to bottom. Offering a range of Guided Holidays and Small Group Journeys, AAT Kings is a leading Tour Operator in New Zealand and Australia's No. 1 Tour Operator. AAT Kings offers a range of touring options that provide fantastic value for money. And you can relax in the comfort of knowing that you're in the best of hands. AAT Kings has years of experience in taking care of absolutely everything so that you can get on with creating great new memories and living the explorer spirit on your adventure through spectacular New Zealand. There are holidays you'll remember. And then there are journeys you'll never forget. Inspiring Journeys believes travel has the ability to transform you and that it's not just about the places you go, it's also about the people you go with, the experiences you share, the memories you create together and the stories you write along the way. On these Journeys, you'll travel in an intimate group, stay in spectacular retreats, lodges and resorts with great cuisine to match and enjoy the rich and immersive experiences you'd expect from a premium touring specialist. Inspiring Journeys strikes the perfect balance between freedom from the stress of planning and just enough flexibility for you to shape your journey so that it suits you down to a tee. Everyone has a story; start your next chapter with Inspiring Journeys. Choose from a selection of great value guided holidays ranging in length from 4 to 17 days. 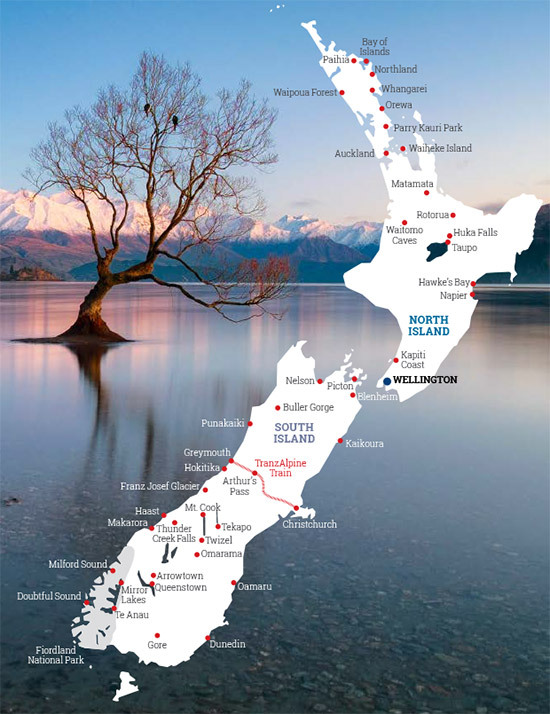 Destinations include Bay of Islands, Auckland, Rotorua, Wellington, Picton, Christchurch, Mt. Cook, Dunedin, Milford Sound, Queenstown, Fox Glacier and Punakaiki. Tours include a professional Tour Director and Tour Driver, luxury coach travel, rooms in quality hotels and perfectly balanced itineraries. People who ordered New Zealand Guided Holidays also ordered the free travel brochures below. Click on the images to find out more about these brochures.